Hi Guys, I'm new to this magracing and am in the process of building a track, a figure of eight on a 5' x 12' board, it is going well and I have all I need apart from the lane change plates. Can someone sell me some or am I going to have to try and make my own? I suggest that you make your own. They are easy and cheap to make. All you need is the steel plate material and tin snips to cut the plates. Just make sure they are completely flat with uniform thickness and no rough & jagged edges. Before making them, read all of the post on the magic of lane change plates. Thanks Ned. I read your post which is a great help. Track building was going really well but has had to be put on hold as I unfortunately have only one car, bought to check the track as I progressed with the build as there are no more for sale or likely to be and driving around solo on a bare chassis is not what I had hoped for. I appeared to have joined a race system that is in decline which is a great shame as it struck me as far superior to slot car racing. Jon i will check tomorrow, but i think i maybe have a ferrari for sale. Thanks Keld. I would be interested if you do have a spare car you could sell me. I am not sure what to do now. If it is not possible to buy new cars, in particular ones with an adjustable chassis, I can see little point in continuing to build my track. I will put it on hold for a while while I consider my options. Yes one Ferrari incl. Controller, 5 white shells (2mclaren, 1 porsche, 2ferrari) 40 batteries some off them brand new, 2 charger 100/240volt with auto cut off when charged. Jon C wrote: Thanks Keld. I would be interested if you do have a spare car you could sell me. Jon, there are hundreds of used cars owned by current or former members of this forum. I suspect that most are not being used anymore. I have the same problem. Want to build a racetrack, first a testtrack, later a bigger one. But without cars it does not make sense. My plan was, to buy first 2 and late 6 to 8 more cars. But if there are no cars available anymore, the hobby does not make sense. Maybe after a while, I would need more cars (some will break by the time etc.). The future of this hobby ist not very shure, althought it should have big prospect, because is has a lot of advantages compared to slotcars. But I dont want to construct cars by myself. @Ned: why do you mean, that there are hundreads of cars, which are not used anymore? Does everybody give up this hobby, or change to slotcars? Boernis wrote: @Ned: what do you mean, that there are hundreads of cars, which are not used anymore? Does everybody give up this hobby, or change to slotcars? I know that Wes Raynor, the original developer of MagRacing, sold hundreds of cars. Wes sold that business to Martin Price and Martin’s business partner who renamed it Magneticracing. I'm quite sure that the majority of Wes's customers were involved in slot cars prior to getting involved in magracing. I have experience with both. I prefer the system of magnetically guided but remotely controlled 1/32 scale model racing cars. The track appears more realistic without a slot. The cars perform more realistic in terms of acceleration, top speed, braking, cornering, and handling with the ability to change lanes in designated places built into the track. Moreover the cars can go forward or reverse eliminating the need for marshalls along the track to retrieve wayward cars. An indoor track is inexpensive and pretty easy to build. A large track permanently installed outside like mine is more difficult. Since there is very little activity on this forum, I suspect that most of the magracing cars are not being used, but I do not know that for sure. From my perspective, someone as interested in realistic modeling as racing, the system offered by Wes Raynor had 3 drawbacks. 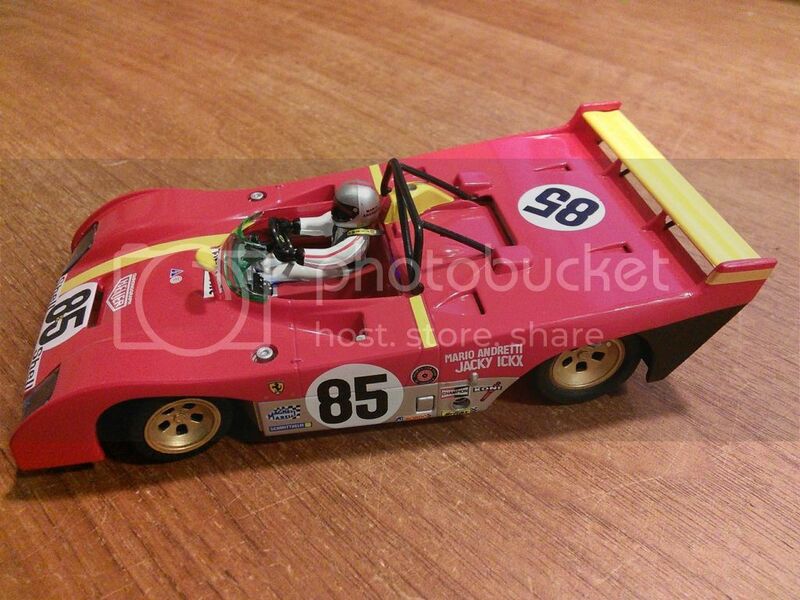 The vac formed bodies did not have much detail and were not accurate scale models of real race cars. Secondly and more importantly, the wheelbase of the chassis was not adjustable. Thus it was not easy to substitute a highly detailed 1/32 slot car body for the stock vac body offered by Wes. Based on comments on this forum 3-4 years ago, I know this was a concern for many early adopters of Wes’s system. Also, the plastic wheels of the original chassis did not provide enough traction. I stated earlier in this thread, it is now possible to buy all parts online needed to build a chassis with an adjustable wheelbase to fit a 1/32 scale slot car body with wheels and tires. Compatible inexpensive RC transmitter/controllers are also available. The only part that is not available in small volume, is the motor. MagRacing or MagneticRacing, by whatever name, it is not a plug and play racing game. In many ways it’s a cross between slot cars and model railroading. 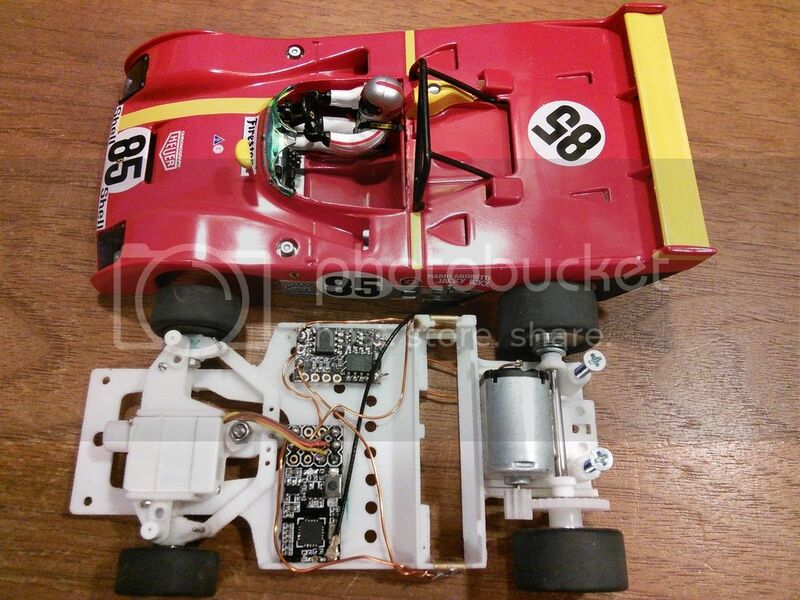 Photos of one of my cars, built with a Slot.it kit can be seen below.